This uplifting and true love story is sure to melt your heart. 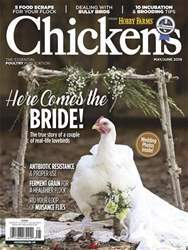 In May 2017, I got a call from my friend who had just found a male chicken that had been tossed to the side at a chicken plant after all its friends had been taken to slaughter. The bird had a broken leg, couldn’t walk and was mean as a snake. When he arrived at my farm, we treated him like we did all our other chickens. We nursed him back to health, made sure he had plenty of exercise and limited his diet (because of his breed). We also spent lots of time together, and somehow, that mean old bird became one of the sweetest and most personable chickens on our farm. We named him Mr. Mayflower.